..He spoke of one song he was particularly proud of, that he’d written “a while back,” that successfully functioned on the level of complexity of his mid-sixties material, taking the listener outside of time.. He said the song was called “Caribbean Wind”. @ #35 on my list of Dylan’s 200 best songs. We got 3 versions of this brilliant song.. the best is the live versions he played on November 12, 1980. I was playin’ a show in Miami in the theater of divine comedy. Preaching faith and salvation, waitin’ on the night to arrive. He was goin’ down slow, just barely stayin’ alive. But it’s only the silence in the buttermilk hills that call. An’ famines and earthquakes and train wrecks and the tearin’ down of the walls. Did you ever have a dream that you couldn’t explain? She had chrome brown eyes that I won’t forget as long as she’s gone. I see a house in the country bein’ torn from within. I can hear my ancestors callin’ from the land far beyond. This is in my opinion a far better version than the “Biograph” version. Couples were dancin’ an’ i lost track of the hours. Playin’ a show in Miami in the theater of divine comedy. When he’s hearin’ footsteps tramplin’ over his flowers. Bringing everything that’s near to me, nearer to the fire. She said, “We got a mutual friend standin’ at the door. Here were payments due and he was a little behind. But it’s only the silence on the buttermilk hills that call. An’ earthquakes and train wrecks and hate words scribbled on walls. But i heard my mirrored destiny said to be movin’ on. But i knew i’d be lyin’ and besides she had already gone. 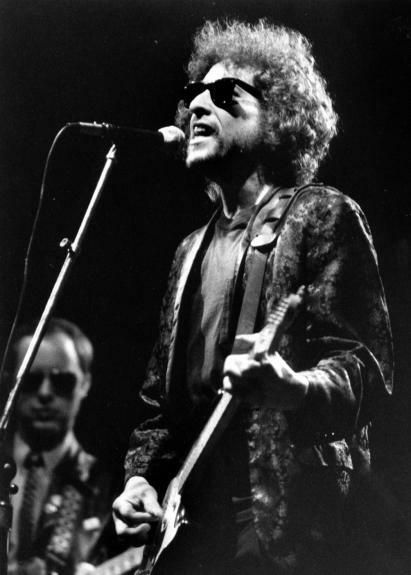 from Nov 12, 1980, Fox Warfield Theatre – San Francisco, California – fantastic version. His single greatest in-concert performance, it should have been released aeons ago. This is a 12-string guitar. First time I heard a 12 string guitar was played by Leadbelly, don’t know if you’ve heard of him? Anyway, he was a prisoner in, I guess it was Texas State Prison, and I forget what his real name was but people just called him Leadbelly. (shout from the audience: “Huddie Leadbetter”) He was recorded by a man named Alan Lomax, I don’t know if you’ve heard of him? Great man, he’s done a lot of good for music. Anyway, he got Leadbelly out and brought him up to New York. And he made a lot of records there. At first he was just doing prison songs and stuff like that. Same man that recorded him also recorded Muddy Waters before Muddy Waters became a big name. Anyway, Leadbelly did most of those kind of songs. He’d been out of prison for some time when he decided to do children’s songs and people said oh, why did Leadbelly change? Some people liked the old ones, some people liked the new ones. Some people liked both songs. But he didn’t change, he was the same man! Anyway, this is a song called …, It’s a new song I wrote a while back. I’m gonna try and do it as good as I can. there’s somebody important here tonight who wants to hear it, so we’ll give it our best …. Attendin’ the show in Miami, in the theater of divine company. That has arisen from the ashes abided in her memory. As the days turned to minutes and the minutes turned back into hours. Could i’ve been used and played as a pawn? But victory was mine, and i held it with the help of God’s power. Preaching resistance, waitin’ for the night to arrive. And i knew he could get out while he still was alive. And earthquakes and train wrecks and death threats written on walls. The curtain was risin’ and like they say, the ship will sail at dawn. But i know i’d be lyin’, and besides she had already gone. Hoping another version surfaces on the rumoured ‘Gospel Years’ Bootleg Series next year (?) … at the very least we can hope for cleaned up versions of the two unreleased versions above. I’m thinking this could be a great volume of the BS – one that surprises a lot of people. ‘I rate Caribbean Wind as one of Dylan’s most important works of the early eighties, mostly as an indicator of the position of his soul, as a man who was now bereft of his family life following the embittered divorce proceedings and who had at first totally embraced Jesus Christ, but was quickly falling out of His grasp – at least the dogmatic grasp of the Christian Vineyard Fellowship, and who would soon return to the religion of his forefathers, Judaism’. A great song. But am I the only one who thinks it should be “bringing everything that’s DEAR to me nearer to the fire”? It makes for a better line too. As a Dutch Dylan fan, I can’t perhaps say anything definitive on what I hear in what is not my first language, but I have always heard /dear to me/. Not only would it make even more sense, and make the lyrics more interesting (avoid repetition), but it would also conform to Dylan’s ability and fondness for internal rhyme. I like to think it is DEAR to me. Genius. This song always gets lumped together with the other “great lost songs of the 80’s” (Angelina, Groom etc), but for me, that really undersells it. For me, it is the next song in the “time-shift” classics that come along every decade: Visions of Joanna, Tangled Up in Blue and then Caribbean Wind. Nice view into Bob’s creative process…and seemingly unlimited ability to create lyrics…love the way he rhymes “howls” and “Isles” in the live version…thanks for posting! Wow. Had not heard the live version before. Many thanks. CW is one of those transcendent, mysterious songs that few artists are able to create. Yet Bob has done it many times, IMO. In every era. And different songs do it for different listeners. Dylan fans can never seem to be in complete agreement. This one yanks you out of the present and forces you to listen to every word and chord. You don’t want it to ever end. “Hear a voice crying ‘daddy’, I always think its for me”. It gives me chills. really enjoying your song compulation comparisons lately. 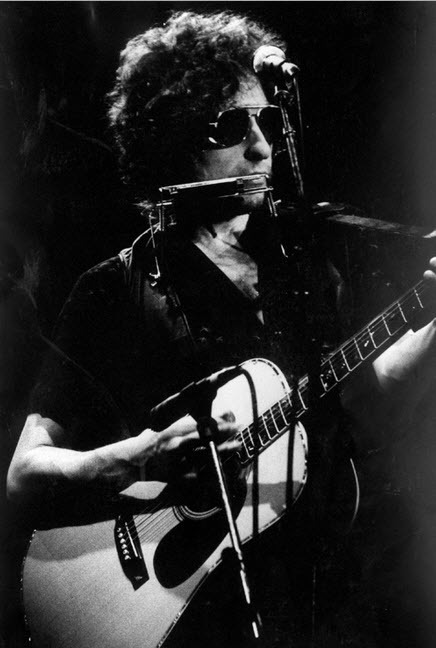 Very enjoyable, the images and of course the different variations of Bob’s songs. I would like to throw a couple of tid bits for reflection. A couple of songs which i feel are penultimate versions are Your a Big Girl Now from Concord June 1988…I think this is a triumph. First night of the NET and Bob nails this song with a solid backing of GE Smith and Neil Young. The second example is two fold in my opinion. 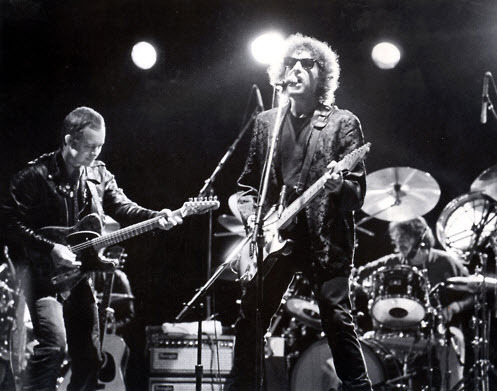 Its all Over Now Baby Blue…..first awesome version is with the Dead Eugene Oregon in 1987. While the Dead sessions were uneven in my opinion, far too loose for Bob, this version seemed to hit and you can hear the confidence in Bob’s voice and the Dead played a great version. The second version of this song is October 1994 Bloomington Indiana. This version soars all the way through, soft and gentle singing. I always imagine Bucky Baxter hanging on to the steel guitar before it veers into outer space. I have actually had tears in my eyes over this version. I dig the Concord-88 version of of YABGN, I also love the Wantagh-88 (june 30) version.. But are they better than the Hard Rain version…? At least sometimes… Their all GREAT! Thanks, this is one of the great “lost” songs from the 80s and 90s. 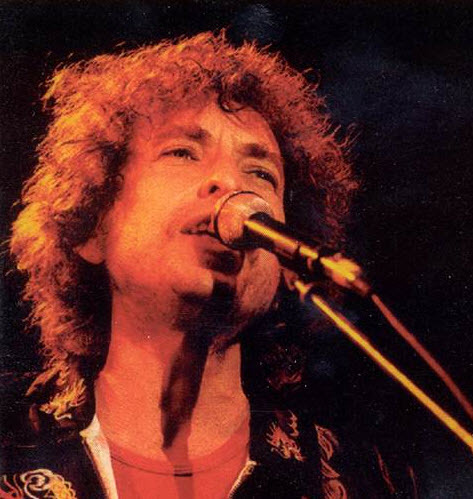 It is interesting to speculate on why Dylan had such a terrible habit of leaving off the best songs in the period from Shot of Love through Time Out of Mind. One theory is that the drawn out studio process and a lack of a compatible producer led Dylan to cast off the songs he cared most about. What was left off – Caribbean Wind, Angelina, Groom’s Still Waiting at the Altar (later added), Blind Willie McTell, Foot of Pride, New Danville Girl, Series of Dreams, Dignity, Red River Shore, Mississippi – is actually a “best of” compilation from this period. After a decade and half of this frustration, he took the reins himself and broke the habit. But imagine if he learned how to produce his own records in the late 70s! Thanks for yet another great comment AWFF! ..and I agree.. if you add some released songs: Every Grain of Sand, Jokerman, Shooting Star & Not Dark Yet… You have a best of compilation from the period. But why doesn’t he play it now? Do you think he is wary of the suggestion in the lyrics of a relationship with a very young female? And also unwilling to excise that element too obviously? Who knows why.. He “got over” Blind Willie McTell.. why won’t he “get over” “Caribbean Wind”..? Maybe it’s because he knew this was an important song, and he worked very hard on getting it right (more so than on BWMT).. and he never felt he managed to deliver. He just can’t face trying it more? I don’t believe the lyrics plays any part in it… He changed them several times during the recording process.. he could (as he’s done so many times) change/adjust the lyrics before taking it live again. Great posting: the live version is just absolutely amazing. For that matter so is the Shot of Love outtake. Why haven’t these great versions surfaced on the Bootleg project? I like all 3 versions, but the live version is best – absolutely stunning. There is loads of material Sony should put out on “Bootleg series”.. and a couple of “Caribbean Wind” versions are among them..
Love these 2 previously unheard versions. I bought a different night of the Fox Warfield performances that — alas — did not include Caribbean Wind. Your comment about the additional bootlegs is priceless: There are so many gems waiting to be released! Nice article on one of Bob’s better songs. Now you got me wondering what the 34 better songs are than this one. I’ve postet 8 songs on my top 200 list… and will continue posting now and then… until all 200 is out. Btw – my top 10 is available on the Lists section.